Say hello to Esther. Esther is 14 years old and lives in the small Ugandan parish of Buyaya. Despite attending the local school for a number of years, Esther cannot read. In fact, Esther cannot even read a single letter. If you show her a flashcard with the letter A on it, she will look at it blankly. During the classroom activities with here classmates at Meaningful Volunteer's RYE School, she waits for here classmates to commit to an answer before following sheepishly. In short, Esther lacks confidence in her ability and will need extra help if she is ever going to be able to read. 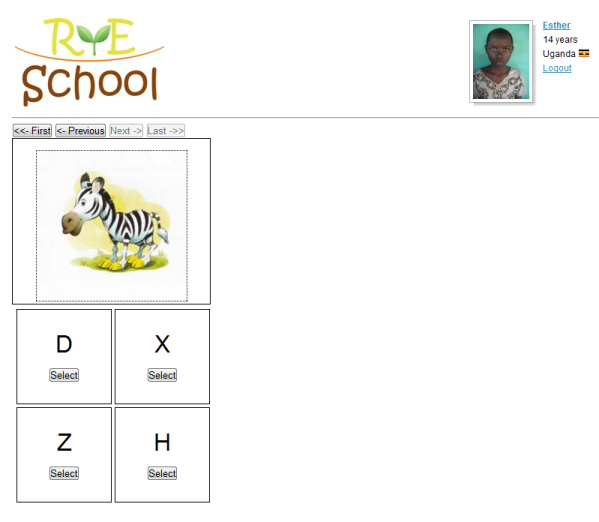 Esther - and many like here in Buyaya - will benefit from a new online phonics course developing by Meaningful Volunteer. The online course will be run at Meaningful Volunteer's internet-enabled solar-powered school in Buyaya. The construction for the school is due to start in July 2011. Listen to the sounds and phoneme of the letters. Simple words, their sounds and associated pictures can also be practised. Esther will be presented with list of options that associate the concepts. For example, she may be presented with the letter S, and choose the sound the matches the letter. The system is now live on the Meaningful Volunteer site. Feel free to log in as Esther (username: Esther password: #Esther) and check out how the system works. Note: Answers are saved within the system. So don't be surprised if answers have already been given by other users testing the system! The interface is keep simple and lightweight to account for the low bandwidth in Buyaya. Screenshots for the system are shown below.